The FORECAST function is one of the statistical functions. 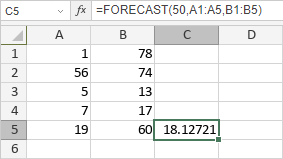 It is used to predict a future value based on existing values provided. x is an x-value used to predict the y-value, a numeric value entered manually or included into the cell you make reference to. array-1(2) is the selected range of cells with the same number of elements.